We started this family tradition in 2010, when our oldest child was still just 6 years old. I didn't know it would become a tradition, but after one year we were hooked. Each year, on Christmas Day, our family wakes up and opens stocking and presents and then eats our Christmas Morning casserole. 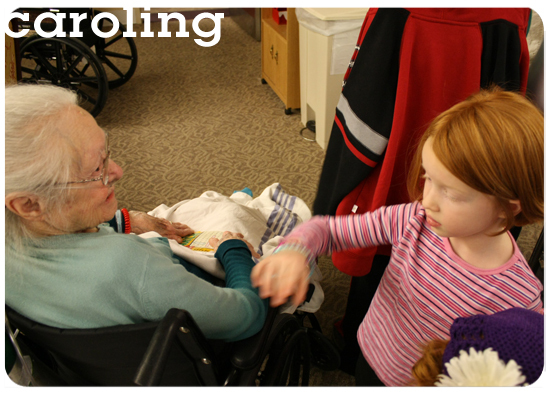 Once we are done and morning turns into early afternoon we get dressed and head to a local Nursing Home to sing. It started when we lived in Lancaster, PA and then after we moved to West Chester, PA and now we sing in Utah. Each year I wait for the moment when my older kids become "too old" for this. Each year I wait for the complaints to roll in about wanting to stay home and play with their new toys, but they never come. Last year when our family was sick and we didn't go to sing our kids mentioned how much they missed singing on Christmas Day. This coming Friday, the Light The World prompt encourages us to visit the lonely. Studies show that 60 percent of those living in a nursing home never get visitors during their stay. So sad! I want to let you know that this tradition has 100% enriched our lives! You don't have to go on Christmas Day (although our family always will). You can go any month in December. 1. DO call ahead and make arrangements: Call a local Nursing Home and check when the best time is to visit. See if they have any other scheduled activities you can plan around, or ask where you would be the most needed to bring joy to residents. 2. DO learn some non-Christmas holiday songs: Even if you live in an area with a large Christian population you want to have a few songs that are not tied to Christmas memorized. Jingle Bells is a great Holiday Song that is not necessarily tied to Christian Christmas. 3. DO interact, talk, visit, and touch: Singing is great and you will see the joy and smiles on the faces of those you sing to, but also take a moment to visit. Reach for the residents' hand, look into their eyes, ask them where they are from or what their favorite song is. These moments are moments when souls connect. 4. DO invite other friends and families to join you: Each year we give an open invitation for others from our Ward to join us. One year the Wright Family from West Chester, PA came along with us and DOUBLED our Christmas cheer! They loved it and so did the residents. 5. DON'T take any food items or treats: Remember that many residents in care facilities have dietary regulations. Don't take cookies or other sweet treats to hand out. 6. DON'T go if you or your kids are sick: Even if the care center you visit isn't a strictly medical facility, the elderly often have compromised immune systems. Don't go if you or your kids have coughs, very runny noses, or sore throats. It's a great idea to plan 2 or 3 visits during the holiday season so if illness strikes your family you still have other opportunities to sing once you are well. Friends, I hope you will accept this challenge and visit the lonely. This tradition has enlarged our hearts, shaped our children's holidays, and filled us with unspeakable joy! And it will for you too! Like this post? Check out these related posts!